Uncirculated and collectable US coins. 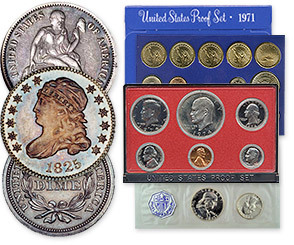 Proof Sets (any year) and Mint Sets (1964 and earlier) from the United States Mint. Turn your collectable coins into cash today. Stop by our convenient Northeast Ohio location, or call 216-650-GOLD for more information. Got a large coin collection? We'll travel to you. To schedule an appointment, please call our coin buying department at 216-650-4653.